NASA’s InSight lander has placed a protective enclosure over a French-developed seismometer designed to detect tremors on Mars, completing the deployment of the first of two science instruments delivered to the Red Planet in November. 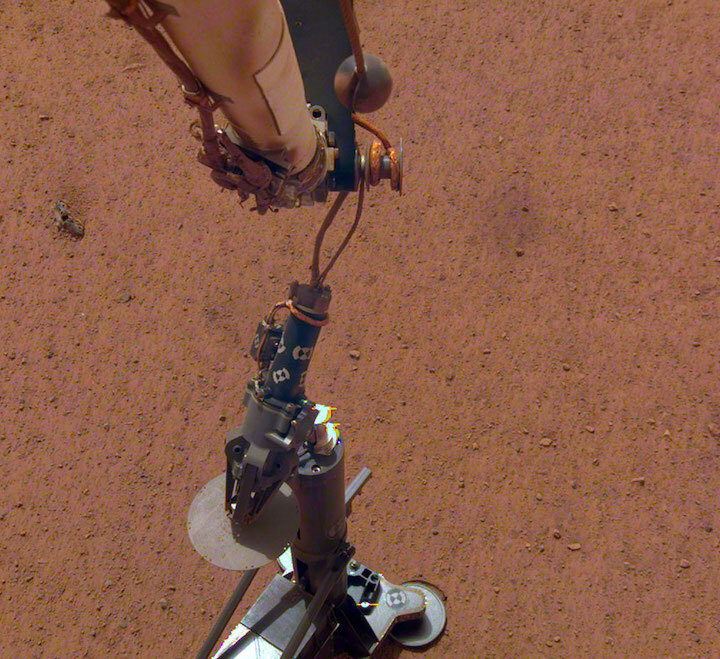 Using its nearly 8-foot-long (2.4-meter) robotic arm, InSight followed commands beamed up from Earth to cover the seismometer package with a dome-shaped wind and thermal shield Saturday. 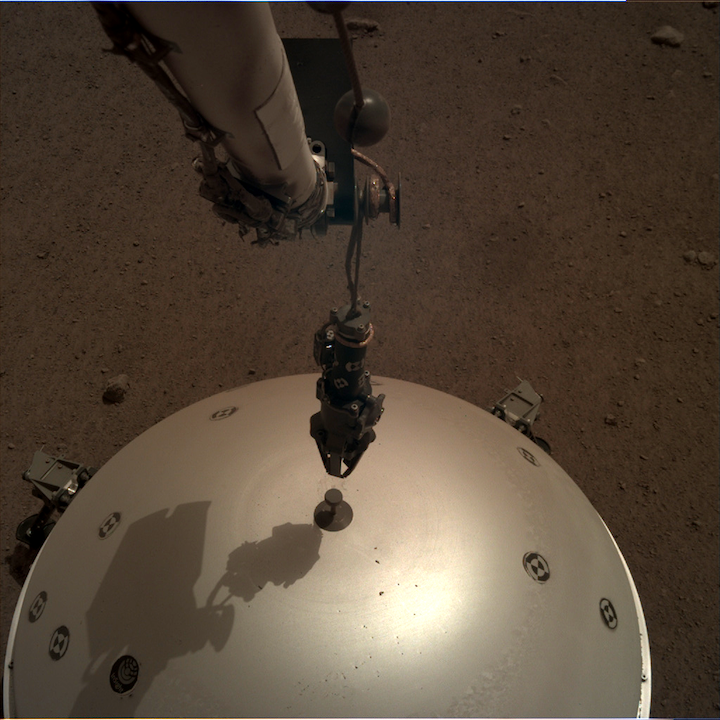 The milestone follows weeks of leveling and cable adjustments since InSight’s robot arm picked up the seismometer itself from the lander’s deck and placed it on a rock-free portion of the Martian surface that was within reach of the stationary lander. The shield will ensure winds and temperature swings do not affect the sensors inside the seismometer instrument. Without the added protection, winds could add “noise” to the instrument’s measurements, making it harder to discern when it registers a quake on Mars, scientists said. Ringed with a thermal barrier and chain mail around the bottom, the wind and thermal shield will also moderate temperatures inside the instrument. Scientists were concerned warming and cooling trends might expand and contract metal springs and other parts inside the instrument, according to NASA. Temperatures measured by InSight since its Nov. 26 landing on Mars fluctuate by about 170 degrees Fahrenheit, or 94 degrees Celsius, over the course of a Martian day, or sol, NASA said in a statement. InSight braked to a rocket-assisted landing at Elysium Planitia, a broad equatorial plain. The seismometer instrument was provided by the French space agency, CNES, and its development was led by the Institut de Physique du Globe de Paris. JPL built the wind and thermal shield, and leads the overall InSight mission. The seismometer package was designed with several layers of insulation against temperature changes on Mars. When some parts inside expand and contract, others are designed to do so in the opposite direction to counteract the effects of the changes, according to NASA. The seismic sensors themselves are encased within a vacuum-sealed titanium sphere, which is then overlaid with a hexagonal copper container with honeycomb cells that trap air and keep it from moving. “Mars provides an excellent gas for this insulation: Its thin atmosphere is primarily composed of carbon dioxide, which at low pressure is especially slow to conduct heat,” NASA said in a statement. The instrument contains three sets of seismic sensors at its core, which was placed on the surface Dec. 19. Scientists will also monitor weather conditions, including winds and temperatures, with a meteorological station carried aboard inSight. The weather information can be applied to seismic measurements to filter out data that might have been corrupted by environmental conditions. Next up for InSight will be the deployment of the mission’s other main instrument: the Heat Flow and Physical Properties Package, or HP3. 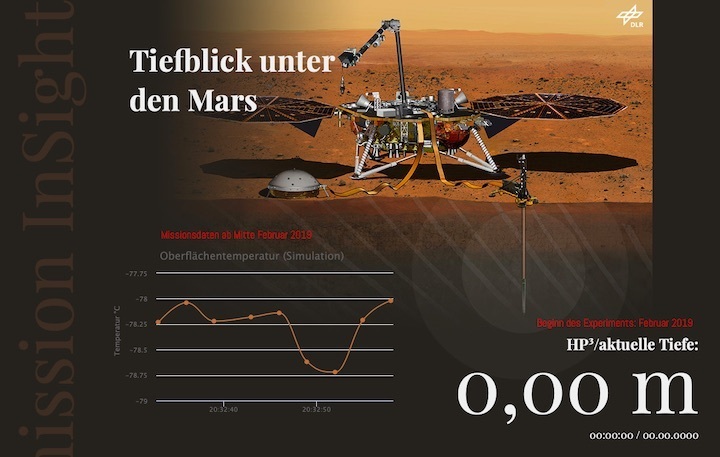 HP3 was developed by DLR, the German space agency, and is scheduled to be transferred from InSight’s instrument deck to the Martian surface with the robot arm next week. The heat probe consists of a mechanized mole that will dig into the Martian crust to a depth of up to 16 feet, or 5 meters, deeper than any previous Mars mission has reached. The mole is expected to take around six weeks to reach that depth with roughly 10,000 individual mechanical hammer blows, accounting for several planned pauses to allow the instrument to record thermal conductivity measurements. The underground probe will measure the heat coming from Mars’s interior, providing information for scientists to study the planet’s internal structure. Combining the heat probe and the seismic results — which will also tell scientists about layers inside Mars — Banerdt’s team seeks to examine how the rocky planets formed in the ancient solar system, providing a comparison for what geologists already know about Earth. The procedures to place the instruments on the Martian surface represent a first in the exploration of Mars. While previous NASA missions have used rovers to drive around the Red Planet, none before InSight have physically placed payloads into permanent positions directly on the surface. The seismometer and heat probe will transmit their readings back to InSight through umbilical cables. The lander will then beam the data back to Earth through communications relay orbiters flying overhead. “I liken it to … playing that “Claw” game at a carnival, but you’re doing it with a really, really valuable prize, and you’re doing it blindfolded, where you can only take occasional pictures, and then you’re doing it via remote control on another planet,” said Elizabeth Barrett, InSight instrument operations lead at JPL, describing the carefully-choreographed procedure to move the instruments to the Martian surface. Engineers created a mock-up of the lander, the instruments and the surrounding environment in a lab at JPL to simulate the instrument deployment procedures before executing them on Mars. “These are waves that were generated, maybe, by a marsquake on the other side of the planet, have traveled all the way through the planet, getting their waveform modified as they go through the planet and picking up information about the deep interior structure, and then we are able to pick it up when it comes back up to the surface under the seismometer,” Banerdt said before InSight’s launch last May. That’s where the wind and thermal enclosure deployed Saturday comes in. Once the instruments are deployed and operational, the InSight science mission is planned to last one Martian year, or roughly two Earth years. 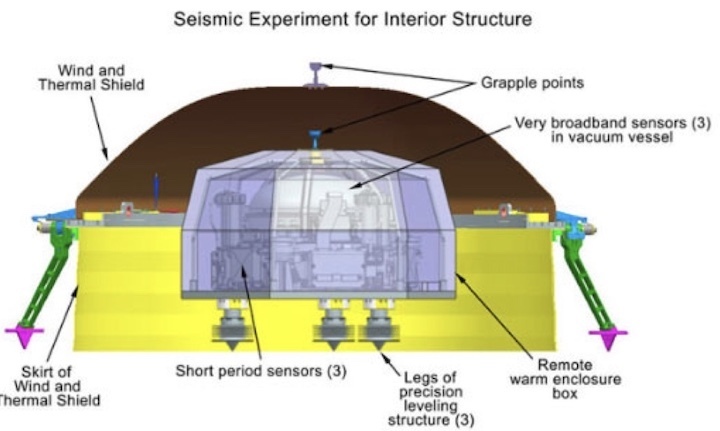 An even bigger concern for InSight's seismometer - called the Seismic Experiment for Interior Structure (SEIS) - is temperature change, which can expand and contract metal springs and other parts inside the seismometer. Where InSight landed, temperatures fluctuate by about 170 degrees Fahrenheit (94 degrees Celsius) over the course of a Martian day, or sol. But even that isn't quite enough. The sphere is enclosed within yet another insulating container - a copper-colored hexagonal box visible during SEIS's deployment. The walls of this box are honeycombed with cells that trap air and keep it from moving. Mars provides an excellent gas for this insulation: Its thin atmosphere is primarily composed of carbon dioxide, which at low pressure is especially slow to conduct heat. A number of European partners, including France's Centre National d'Études Spatiales (CNES) and the German Aerospace Center (DLR), are supporting the InSight mission. CNES and the Institut de Physique du Globe de Paris (IPGP) provided the Seismic Experiment for Interior Structure (SEIS) instrument, with significant contributions from the Max Planck Institute for Solar System Research (MPS) in Germany, the Swiss Federal Institute of Technology (ETH Zurich) in Zurich, Switzerland, Imperial College London and Oxford University in the United Kingdom, and JPL. DLR provided the Heat Flow and Physical Properties Package (HP3) instrument, with significant contributions from the Space Research Center (CBK) of the Polish Academy of Sciences and Astronika in Poland. Spain's Centro de Astrobiología (CAB) supplied the wind sensors. NASA's InSight Mars lander acquired this image of the area in front of the lander using its lander-mounted, Instrument Context Camera (ICC). 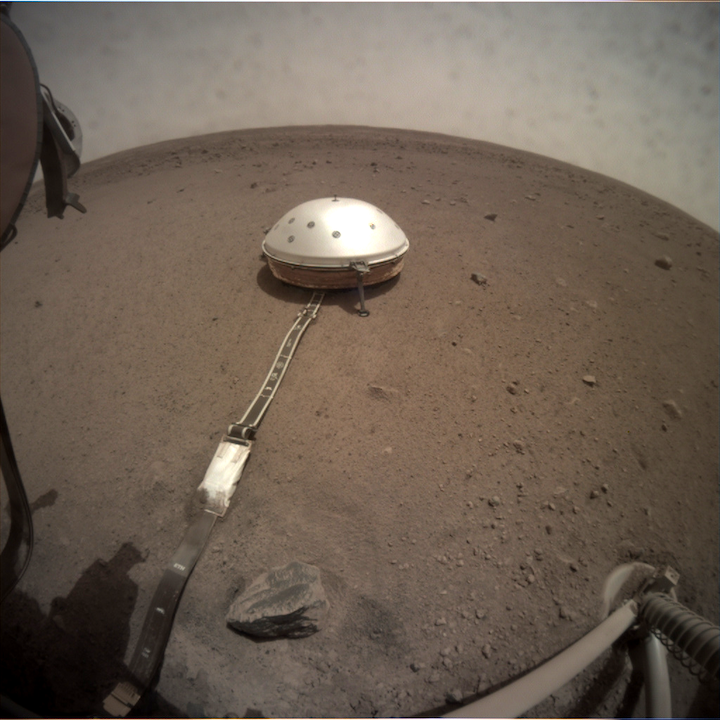 This image was acquired on February 9, 2019, Sol 73 of the InSight mission where the local mean solar time for the image exposures was 13:43:06.903 PM. Each ICC image has a field of view of 124 x 124 degrees. This image was acquired on February 9, 2019, Sol 73 where the local mean solar time for the image exposures was 14:03:06.915 PM. Each IDC image has a field of view of 45 x 45 degrees. 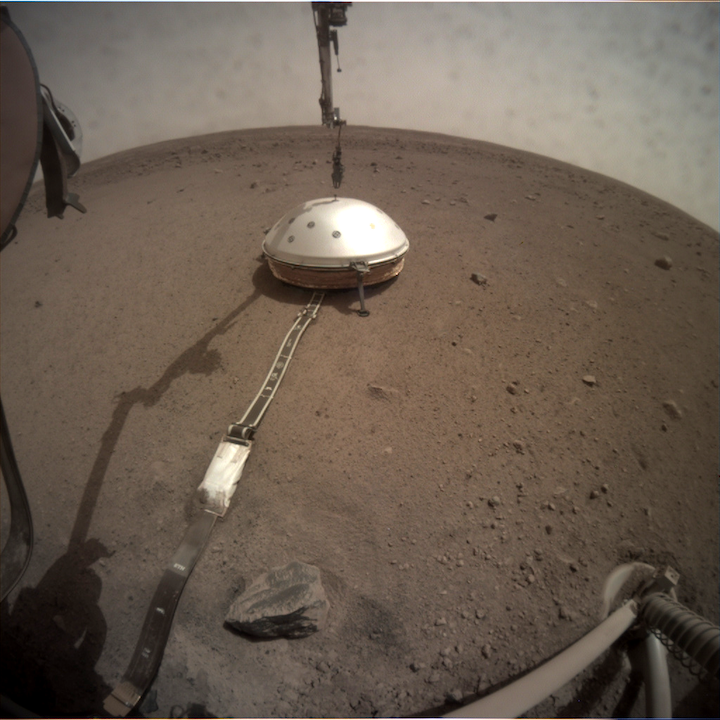 This image was acquired on February 9, 2019, Sol 73 of the InSight mission where the local mean solar time for the image exposures was 14:13:24.926 PM. Each ICC image has a field of view of 124 x 124 degrees. This image was acquired on February 9, 2019, Sol 73 where the local mean solar time for the image exposures was 14:40:02.996 PM. Each IDC image has a field of view of 45 x 45 degrees. This image was acquired on February 10, 2019, Sol 74 where the local mean solar time for the image exposures was 15:03:18.538 PM. Each IDC image has a field of view of 45 x 45 degrees. 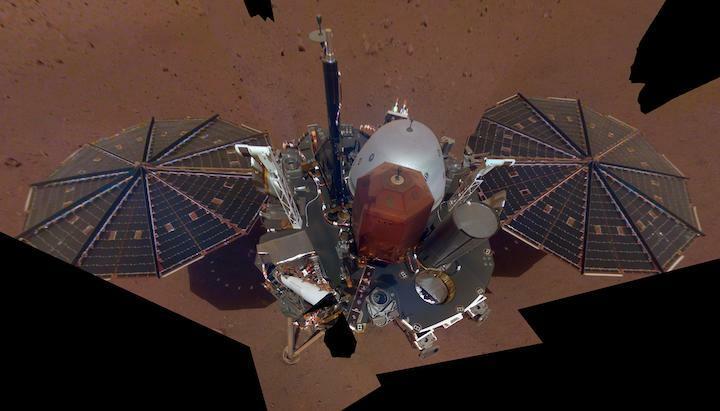 NASA's InSight lander has been busy on Mars preparing to begin scientific observations, and the mission passed another milestone this weekend, when the spacecraft began preparing to deploy its final instrument. That instrument is the heat probe, which, if all goes well, will drill itself about 16 feet (5 meters) into Mars over the course of about two months. 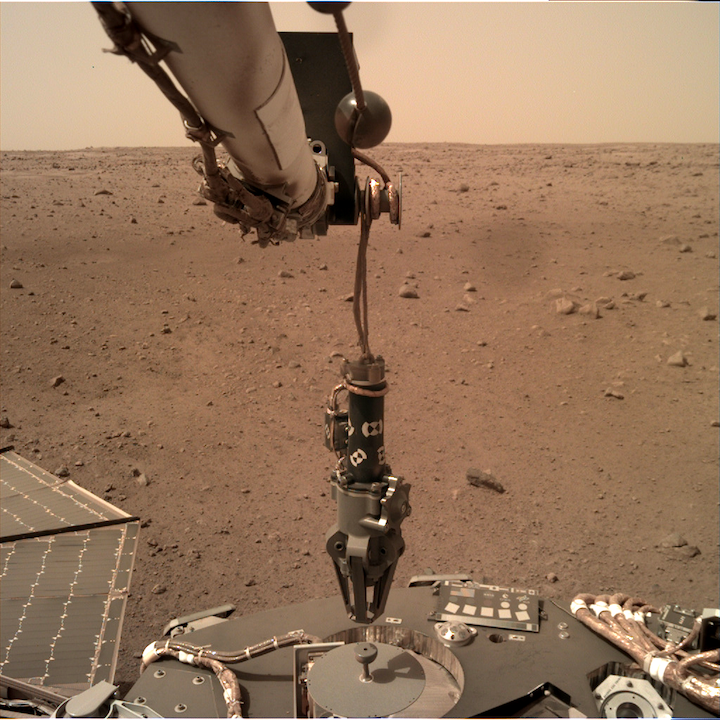 The deployment process, like that for the lander's seismometer, relies on the grapple-like claw at the end of InSight's robotic arm. As of yesterday (Feb. 10), the claw is grasping the heat probe in preparation for deployment. As the probe burrows into the Martian soil, it will take measurements of how heat flows throughout the planet. That should help scientists understand the properties of Martian regolith. The heat probe will follow its predecessor, the seismometer instrument that will track seismic waves through the interior Mars to try to map its structure. Scientists believe the planet is home to so-called marsquakes, which would create such waves, but the seismometer will also register echoes from meteorite impacts and from the heat probe itself during its drilling process. 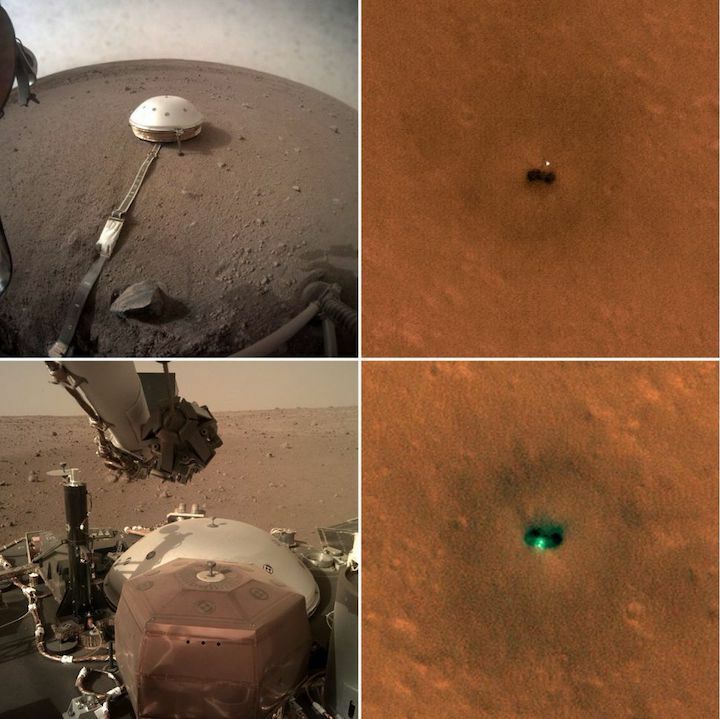 Scientists have images of the seismometer not only taken by the lander itself, but also as spotted by the Mars Reconnaissance Orbiter, which has been circling the planet since March 2006. One of the instruments on board is a camera called HiRISE, which is able to capture detailed images of the Red Planet's surface. Those images are so detailed that the polygonal solar panels of the lander itself, as well as the white spot of the seismometer's white protective cover, are visible. Mit der NASA-Landesonde InSight startete am 5. Mai 2018 eine Mission, die mit geophysikalischen Messungen direkt auf der Marsoberfläche den inneren Aufbau und den Wärmehaushalt des Planeten erkunden wird. Das Deutsche Zentrum für Luft- und Raumfahrt (DLR) hat mit dem Instrument HP3 (Heat Flow and Physical Properties Package) ein Experiment zu dieser Mission beigesteuert. Am 26. November 2018 ist InSight nördlich des Äquators in der Ebene Elysium Planitia gelandet. Nach einer Testphase kann mit den Experimenten nach der Jahreswende 2018/19 begonnen werden. Die Missionsdauer ist zunächst auf ein Marsjahr festgelegt, das entspricht zwei Erdenjahren. Es ist das erste Mal seit der Astronautenmission Apollo 17 im Jahr 1972, dass Wärmeflussmessungen mit einem Bohrmechanismus auf einem anderen Himmelskörper durchgeführt werden. Hauptziel des Experiments ist es, aus den Messungen des Wärmeflusses unter der Oberfläche den thermischen Zustand des Marsinneren ableiten zu können. Mit Hilfe der Daten können Modelle der Entwicklung des Mars, seiner chemischen Zusammensetzung und auch des inneren Aufbaus überprüft werden. Aus den Messungen auf dem Mars können auch Schlüsse für die frühe Entwicklung der Erde gezogen werden. Auch wenn der Mars das Ziel der InSight-Mission ist, so geht es doch im Kern nicht nur um die Erforschung des Roten Planeten. 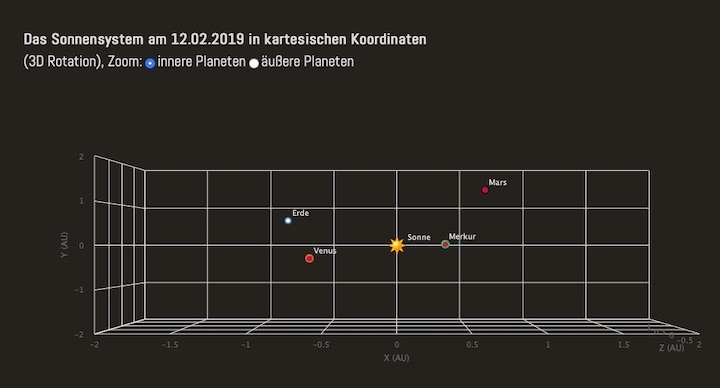 Vielmehr wollen die Wissenschaftlerinnen und Wissenschaftler einen Beitrag zur Erforschung terrestrischer Planeten im Allgemeinen leisten. Terrestrisch bedeutet in diesem Fall, dass es sich um Gesteinsplaneten handelt, die aus einem Eisenkern, einem Gesteinsmantel sowie einer chemisch differenzierten Kruste aufgebaut sind. Der Mars ist hierfür ein ideales Missionsziel, da er in seiner Geschichte genau das richtige Maß an Aktivität entwickelt hat: Einerseits ist er groß genug, um Prozesse wie Vulkanismus und Tektonik zu entwickeln, andererseits ist er klein genug, um die Spuren dieser Aktivität über Jahrmilliarden zu erhalten. Aus diesem Grund hat sich die NASA im Rahmen ihres Discovery-Programms entschieden, InSight für einen Start zum Mars auszuwählen. Schließlich hob InSight am 5. Mai 2018 um 5.05 Uhr Ortszeit an Bord einer Atlas-Trägerrakete von der Vandenberg Air Force Base an der kalifornischen Pazifkküste ab. (*). Nach einer halbjährigen Reise durch das All - hat der InSight Lander am 26. November 2018 auf dem Mars aufgesetzt. InSight ist die erste Mission, die den Fokus auf die geophysikalische Erkundung des Sonnensystems legt. Ihre Instrumentierung ist für die Planetenforschung ungewöhnlich: Ein Seismometer sowie eine Wärmeflusssonde. Das Seismometer (*), das vom Institut de Physique de Globe de Paris (IPGP) in Zusammenarbeit mit dem Imperial College London, der ETH Zürich sowie dem Max-Planck-Institut für Sonnensystemforschung gebaut wird, soll die innere Struktur des Planeten sowie die Größe seines Kerns bestimmen. Die Wärmeflusssonde (*), die unter Leitung des DLR-Instituts für Planetenforschung in Berlin mit dem DLR-Institut für Raumfahrtsysteme in Bremen und mit dem Institut für Weltraumforschung in Warschau gebaut wird, soll hingegen die Temperaturverteilung im Inneren des Planeten bestimmen, woraus Rückschlüsse auf die chemische Zusammensetzung und Aktivität des Planeten gezogen werden können. Somit werden zum ersten Mal direkte Messungen dieser fundamentalen planetaren Kenngrößen möglich, die bisher nur aus Gravitationsfeldmessungen indirekt abgeleitet werden konnten. Um den Wärmefluss eines Planeten bestimmen zu können, muss der Temperaturgradient im Untergrund gemessen werden. Die Astronauten von Apollo 17 nutzten 1972 hierfür Schlagbohrer, mit denen Bohrlöcher von bis zu drei Meter Tiefe in den Mond-Grund getrieben wurden. Aufgrund des störenden Einflusses der Marsatmosphäre ist diese Tiefe für InSight nicht ausreichend. Deshalb soll das vom DLR gebaute Heat Flow and Physical Properties Package – kurz HP³ – Temperatursensoren bis in eine Tiefe von fünf Metern bringen – keine leichte Aufgabe. HP³ nutzt hierfür einen sogenannten elektromechanischen „Maulwurf“, der aus einem mechanischen Schlagmechanismus besteht und die Sensoren in Millimeterschritten in den Boden treibt. Zur Unterstützung der Wärmeflussmessung besitzt HP³ des Weiteren ein Radiometer, das die Oberflächentemperatur an der Landestelle überwacht. Aus den Daten der Oberflächentemperatur sowie den Temperaturen im Untergrund werden die DLR-Wissenschaftler dann den planetaren Wärmefluss ableiten. Der Betrieb von HP³ wird im Kontrollzentrum MUSC des DLR in Köln koordiniert werden. InSight ist bereits die zwölfte Mission im Discovery-Programm der NASA, das sich durch kosteneffiziente Projekte mit einem vergleichsweise geringen Budget von rund 500 Millionen US-Dollar auszeichnet. Markenzeichen der Discovery-Missionen ist die starke Fokussierung auf bestimmte wissenschaftliche Fragestellungen. Geleitet wird die Mission von Dr. Bruce Banerdt vom Jet Propulsion Laboratory (JPL), einem der renommiertesten amerikanischen Marsforscher. Neben dem DLR ist auch die französische Weltraumorganisation CNES beteiligt. 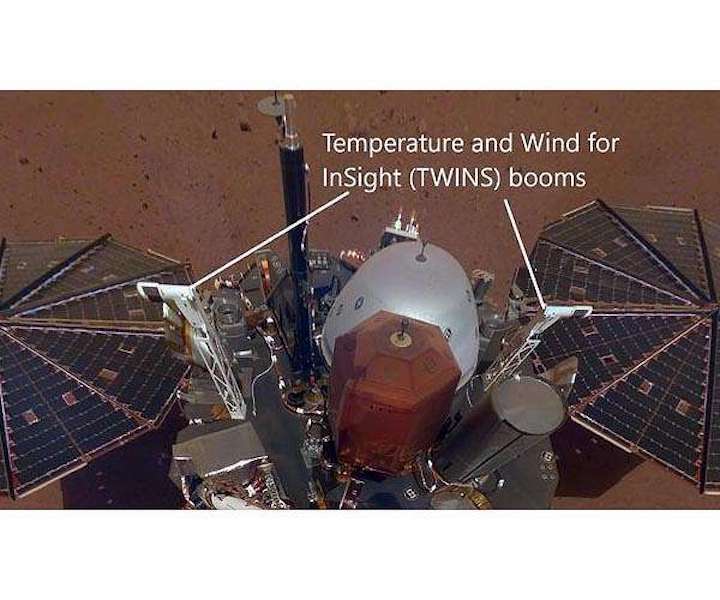 The white east- and west-facing booms - called Temperature and Wind for InSight, or TWINS - on the deck of NASA's InSight lander belong to its suite of weather sensors. No matter how cold your winter has been, it's probably not as chilly as Mars. Check for yourself: Starting today, the public can get a daily weather report from NASA's InSight lander. This public tool includes stats on temperature, wind and air pressure recorded by InSight. Sunday's weather was typical for the lander's location during late northern winter: a high of 2 degrees Fahrenheit (-17 degrees Celsius) and low of -138 degrees Fahrenheit (-95 degrees Celsius), with a top wind speed of 37.8 mph (16.9 m/s) in a southwest direction. The tool was developed by NASA's Jet Propulsion Laboratory in Pasadena, California, with partners at Cornell University and Spain's Centro de Astrobiologia. JPL leads the InSight mission. Through a package of sensors called the Auxiliary Payload Subsystem (APSS), InSight will provide more around-the-clock weather information than any previous mission to the Martian surface. The lander records this data during each second of every sol (a Martian day) and sends it to Earth on a daily basis. The spacecraft is designed to continue that operation for at least the next two Earth years, allowing it to study seasonal changes as well. The tool will be geeky fun for meteorologists while offering everyone who uses it a chance to be transported to another planet. "It gives you the sense of visiting an alien place," said Don Banfield of Cornell University, in Ithaca, New York, who leads InSight's weather science. "Mars has familiar atmospheric phenomena that are still quite different than those on Earth." Constantly collecting weather data allows scientists to detect sources of "noise" that could influence readings from the lander's seismometer and heat flow probe, its main instruments. Both are affected by Mars' extreme temperature swings. The seismometer, called the Seismic Experiment for Interior Structure (SEIS), is sensitive to air pressure changes and wind, which create movements that could mask actual marsquakes. "APSS will help us filter out environmental noise in the seismic data and know when we're seeing a marsquake and when we aren't," Banfield said. "By operating continuously, we'll also see a more detailed view of the weather than most surface missions, which usually collect data only intermittently throughout a sol." APSS includes an air pressure sensor inside the lander and two air temperature and wind sensors on the lander's deck. Under the edge of the deck is a magnetometer, provided by UCLA, which will measure changes in the local magnetic field that could also influence SEIS. It is the first magnetometer ever placed on the surface of another planet. InSight will provide a unique data set that will complement the weather measurements of other active missions, including NASA's Curiosity rover and orbiters circling the planet. 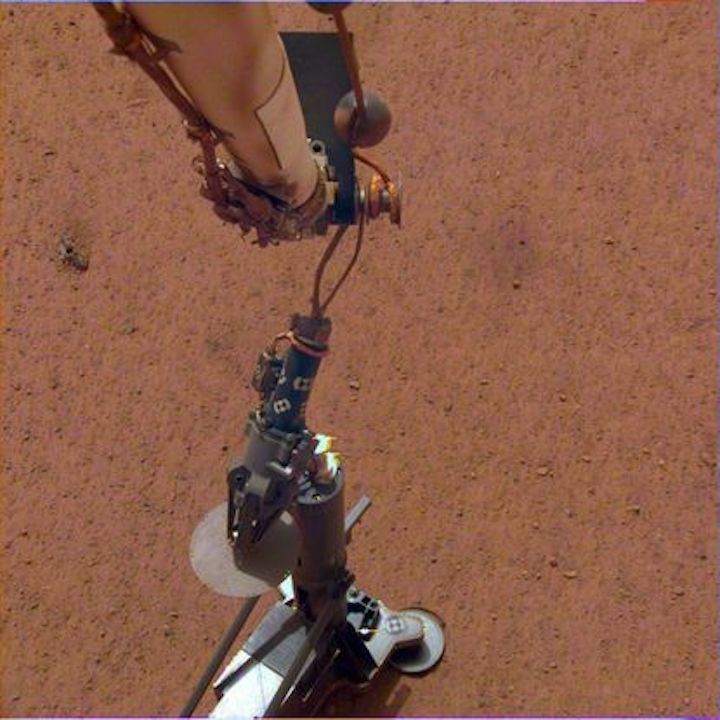 InSight's air temperature and wind sensors are actually refurbished spares originally built for Curiosity's Rover Environmental Monitoring Station (REMS). These two east- and west-facing booms sit on the lander's deck and are calledTemperature and Wind for InSight (TWINS), provided by Spain's Centro de Astrobiologia. TWINS will be used to tell the team when strong winds could interfere with small seismic signals. But it could also be used, along with InSight's cameras, to study how much dust and sand blow around. Scientists don't know how much wind it takes to lift dust in Mars' thin atmosphere, which affects dune formation and dust storms - including planet-encircling dust storms like the one that occurred last year, effectively ending the Opportunity rover's mission. APSS will also help the mission team learn about dust devils that have left streaks on the planet's surface. Dust devils are essentially low-pressure whirlwinds, so InSight's air pressure sensor can detect when one is near. It's highly sensitive - 10 times more so than equipment on the Viking and Pathfinder landers - enabling the team to study dust devils from hundreds of feet (dozens of meters) away. "Our data has already shown there are a lot of dust devils at our location," Banfield said. "Having such a sensitive pressure sensor lets us see more of them passing by." The Heat Flow and Physical Properties Package (HP3) instrument aboard NASA's InSight Mars lander burrows into the Martian soil for the first time on Feb. 28, 2019. The "mole" aboard NASA's InSight Mars lander has encountered stiff resistance on its first subsurface sojourn beneath the surface of the Red Planet. 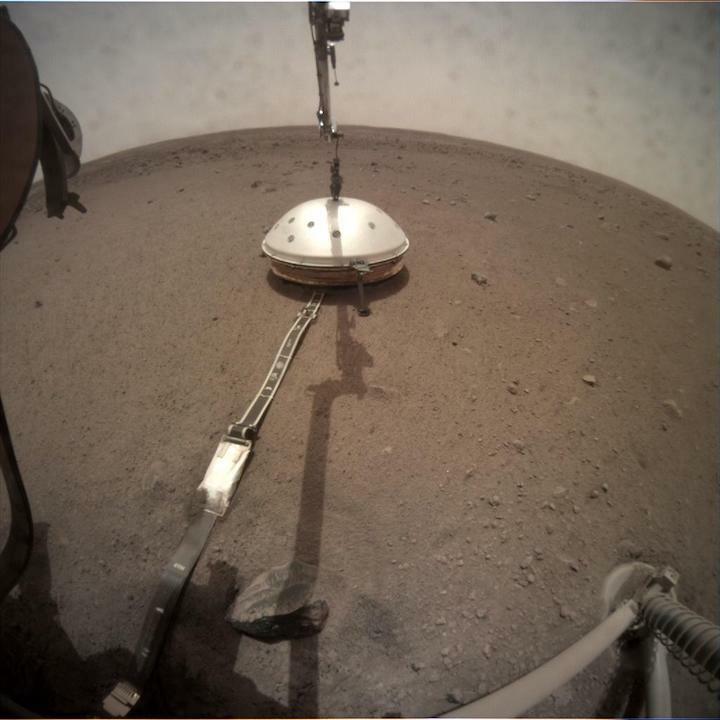 In a major mission milestone, InSight's Heat Flow and Physical Properties Package (HP3) instrument burrowed underground for the first time on Feb. 28. 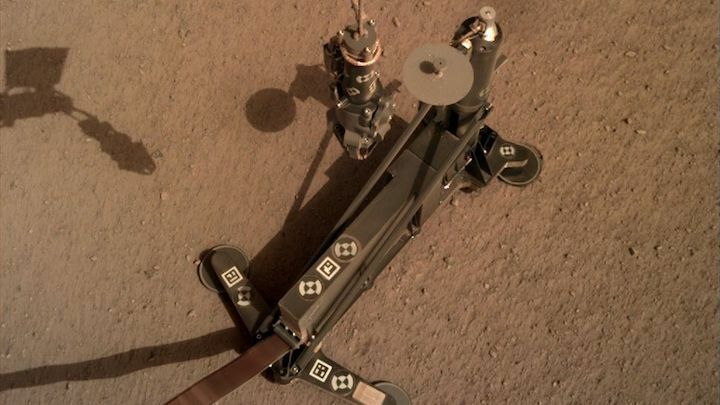 After 400 hammer blows over the course of four hours, the instrument apparently got between 7 inches and 19.7 inches (18 to 50 centimeters) beneath the red dirt — but obstacles slowed its progress, mission team members said. "On its way into the depths, the mole seems to have hit a stone, tilted about 15 degrees and pushed it aside or passed it," HP3 principal investigator Tilman Spohn, of the German Aerospace Center (known by its German acronym, DLR), said in a statement. "The mole then worked its way up against another stone at an advanced depth until the planned four-hour operating time of the first sequence expired," Spohn added. "Tests on Earth showed that the rod-shaped penetrometer is able to push smaller stones to the side, which is very time-consuming." The $850 million InSight lander — whose name is short for Interior Exploration using Seismic Investigations, Geodesy and Heat Transport — touched down on Nov. 26. The spacecraft aims to map the Red Planet's interior in unprecedented detail. It will do this primarily by characterizing "marsquakes" and other vibrations with a suite of supersensitive seismometers, which was built by a consortium led by the French space agency CNES; and measuring subsurface heat flow with HP3, which DLR provided. In a Mars-exploration first, InSight placed both of these instruments directly on the Martian dirt using its robotic arm. The seismometers do their work on the surface, but HP3 needs to go down — much deeper down than it's managed to get so far. The mission team wants the mole to get between 10 feet and 16.5 feet (3 to 5 meters) underground when all is said and done. "The mole will pull a 5-meter-long tether equipped with temperature sensors into the Martian soil behind it," DLR officials wrote in the same statement. "The cable is equipped with 14 temperature sensors in order to measure the temperature distribution with depth and its change with time after reaching the target depth and thus the heat flow from the interior of Mars." InSight's surface mission is designed to last for at least one Martian year, which is equivalent to 687 Earth days. NASA's Mars InSight mission has hit a snag: Its heat probe appears to have struck an obstacle just below the surface of the red planet. The instrument, which was designed to hammer itself 16 feet underground, encountered some kind of resistance over the weekend and hasn’t made progress since. On Tuesday, scientists announced they would stop hammering and try to find a way around the problem. The team operating the probe is attempting to dig the deepest hole ever drilled on another planet with a tool that weighs less than seven pounds and uses less power than a cellphone. It’s not exactly easy. “We knew from the beginning that this part of InSight was a risky part,” said Tilman Spohn, the principal investigator in charge of the heat probe. The team members also knew they might be stymied at some point. “But we were a bit surprised that it came so soon,” said Spohn, a researcher with the German Aerospace Center in Berlin. 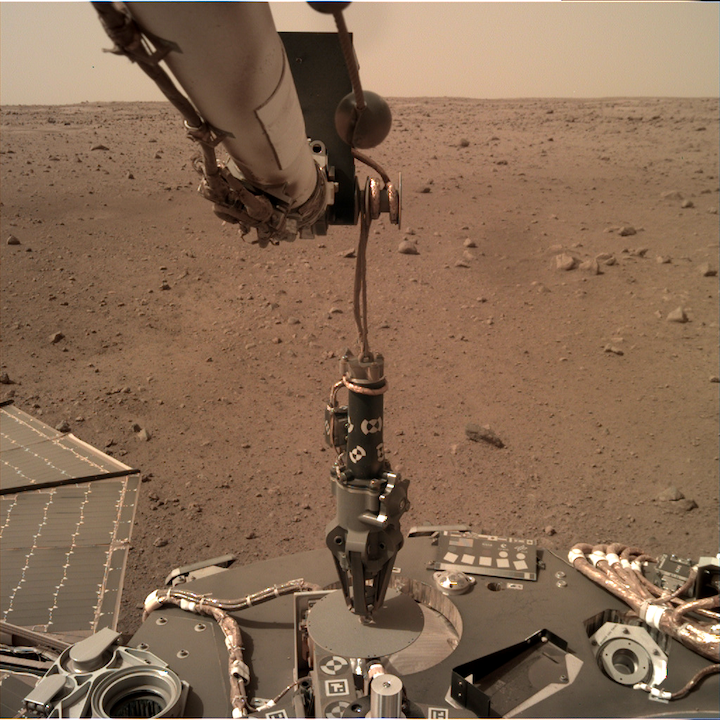 The Heat Flow and Physical Properties Package, or HP3, was successfully deployed by the lander’s mechanical arm on Feb. 12. Its mission is to measure the heat escaping from Mars’ interior, which will give scientists clues about the planet’s composition and history. Engineers at the Jet Propulsion Laboratory in La Cañada Flintridge first tried to fire up the probe — nicknamed “the mole” — last week. But the command failed to reach the Mars Odyssey orbiter, which was supposed to pass it on to InSight in a game of interplanetary telephone. After two days of delay, the burrowing got underway on Thursday. The mole punched out of its housing and into the Martian soil, making quick progress during the first five minutes. Then something changed. The mole continued hammering for four more hours, but it couldn’t go much deeper. In addition, it is now pitched to one side, leaning about 15 degrees off vertical. Mission scientists estimate the probe has reached a depth of about a foot, meaning one end of the 16-inch mole is still sticking out of the ground. The most likely explanation for the holdup is that the probe has hit a buried boulder or a layer of gravel. 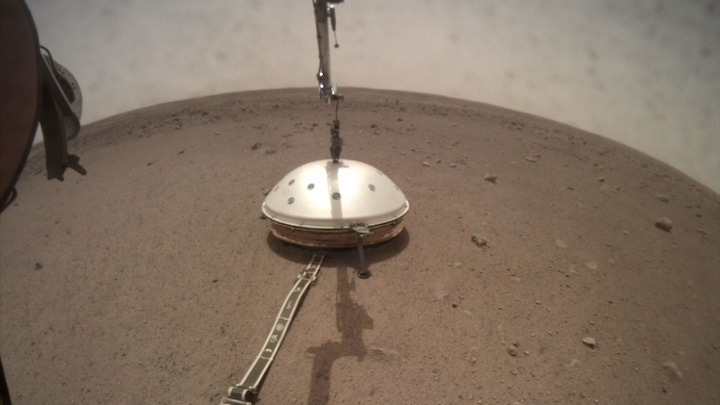 Scientists picked InSight’s landing spot because it appeared to be soft and sandy. However, they were aware that something like this was a possibility. Tests conducted in Germany, where the instrument was developed, suggest the probe should be able to work its way around small rocks and through layers of pebbles. Based on its tilt, researchers surmised it may have already fought its way past one obstacle, only to immediately encounter another. Engineers tried a second bout of hammering on Saturday to see whether the probe could push through. “Keep your fingers crossed!” Spohn wrote in the logbook before the attempt. But from what researchers can tell, the effort yielded little success. “We cannot really say that we did no progress on Saturday, but we can say that we did not make enough progress,” Spohn said. Now the researchers have decided to pause the project for two weeks to come up with a new plan and test it using models and spare instruments housed at JPL. The good news, Spohn said, is that “we are still in a situation where we could do something about it.” Since part of the mole is above ground, researchers are considering whether to use the robotic arm to press on the probe and absorb some of the shock from hitting the obstacle. They could also use the arm to try to right the instrument. Or they could also decide to keep hammering, since tests of the probe showed that it often takes time for the mole to work its way around obstacles. “I’m reasonably optimistic that we can figure out ways of handling it, and at least convince it to go a little deeper,” Spohn said. The probe itself still seems to work fine, and researchers will take advantage of the break to collect the first round of data. Another instrument in the HP3 package has already started to track changes in the surface temperature during eclipses of the moon Phobos, which orbits Mars every eight hours. This week, it will cast a shadow over InSight’s landing site three times. The first eclipse occurred Tuesday, and Spohn said preliminary data registered a slight cooling. The speed and degree of change tell researchers about the nature of the Martian surface, he said. These readings will help scientists gauge the planet’s heat flow more accurately if and when the mole is finally deployed as planned. InSight’s team members still hope that will happen, but they know better than to take anything for granted. “Planetary exploration is not as easy as pie!” Spohn wrote Tuesday in the logbook. 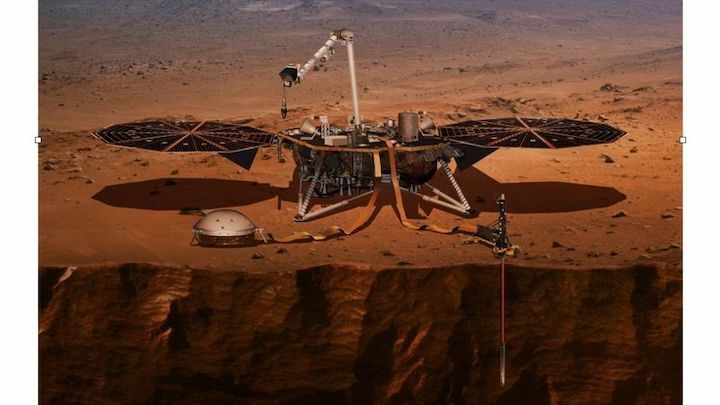 NASA's Mars InSight lander has a probe designed to dig up to 16 feet (5 meters) below the surface and measure heat coming from inside the planet. 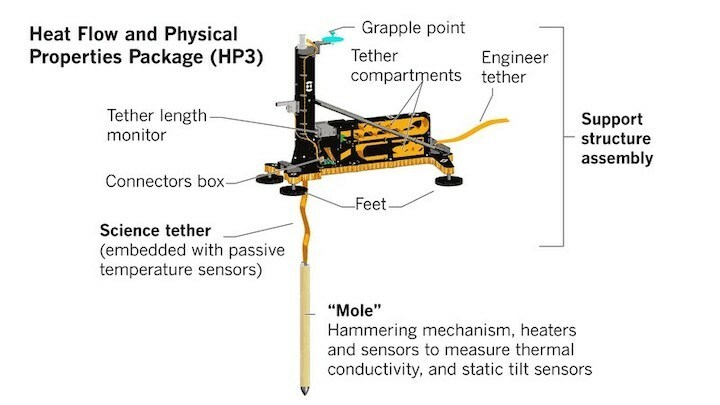 After beginning to hammer itself into the soil on Thursday, Feb. 28, the 16-inch-long (40-centimeter-long) probe - part of an instrument called the Heat and Physical Properties Package, or HP3 - got about three-fourths of the way out of its housing structure before stopping. No significant progress was seen after a second bout of hammering on Saturday, March 2. Data suggests the probe, known as a "mole," is at a 15-degree tilt. Scientists suspect it hit a rock or some gravel. The team had hoped there would be relatively few rocks below ground, given how few appear on the surface beside the lander. Even so, the mole was designed to push small rocks aside or wend its way around them. The instrument, which was provided for InSight by the German Aerospace Center (DLR), did so repeatedly during testing before InSight launched. Data show that the probe itself continues to function as expected: After heating by 50 degrees Fahrenheit (28 degrees Celsius), it measures how quickly that heat dissipates in the soil. This property, known as thermal conductivity, helps calibrate sensors embedded in a tether trailing from the back of the mole. Once the mole is deep enough, these tether sensors can measure Mars' natural heat coming from inside the planet, which is generated by radioactive materials decaying and energy left over from Mars' formation. The team will be conducting further heating tests this week to measure the thermal conductivity of the upper surface. They will also use a radiometer on InSight's deck to measure temperature changes on the surface. Mars' moon Phobos will pass in front of the Sun several times this week; like a cloud passing overhead, the eclipse will darken and cool the ground around InSight.